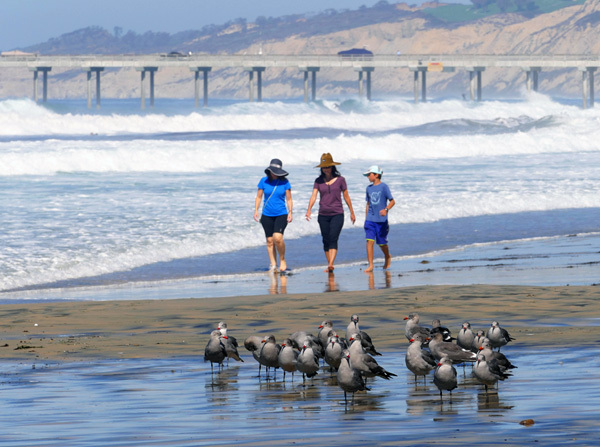 La Jolla Shores has something for everyone. This large, beautiful beach is patrolled by lifeguards and allows swimming, boogie boarding, surfing, kayaking, scuba diving & snorkeling. La Jolla Shores is the site of one of the nation’s most precious underwater marine preserves – a delight for snorkelers and divers. Adjacent Kellogg Park also provides large, grassy picnic areas, including bathrooms and new children’s playground equipment. We also provide: beach towels & chairs, boogie boards, sand toys, folding wagon, iron & board, rolling cooler, BBQ grill, pack-n-play, childrens’ books, video and music libraries, board games, high chair, hair dryers, laundry in unit & laundry products. Walk to the beach in 4 minutes from this charming, clean, and centrally-located, 2-bedroom, 2-bath, 2nd-story residence overlooking Avenida De La Playa. Everything you see in our photos is within walking distance. Here’s why our guests call this the perfect location. No nighttime beach party noise, but still close enough to roast marshmallows with the kids before retiring. The living area is a delightfully relaxing, open, combined living/kitchen space with a bedroom and bath at each end. If clean and comfortable are important to you, this is a jewel. A ‘Westin Heavenly Bed’ king mattress in the master bedroom. The living area and master bedroom include flat-panel TV’s. Cable and wireless high-speed internet & printer are available. Granite counters, ceiling fans, a/c and plush carpeting throughout. Your private entry gate is complete with security code. You will be delighted at being just steps away from many of the area’s best casual and fine-dining restaurants. The Marine Room, Piatti’s, Barbarella’s, Osteria Romantica, Cusp, the La Jolla Beach and Tennis Club, Shorehouse Kitchen, Jeff’s Burgers, A Shore Thing, El Charro, Starbucks and the Shores Restaurant are all just yards away. A bus stop is within walking distance for those who want to sightsee in the San Diego area without a car.